As advances in technology march on, new products naturally are able to pack more and more power into an ever-shrinking profile. If you think about it, just a few years ago our laptops were slow, bulky chunks of plastic who’s specs pale in comparison to modern smart phones. But now consumers demand machines that are powerful as well as extremely portable and amazingly light. To answer this demand, Intel created a new strict set of specifications for notebooks that reduces size and weight without compromising on battery life and performance, calling them Ultrabooks. Today we are taking a look at one of Samsung’s entries, the Series 5. This laptop features a 2nd gen. Intel Core i5-2467M processor, 4GB DDR3 memory, a 128GB SSD, and a 13.3″ LED backlit screen, all while staying under 16mm thick and weighing just 3.25 pounds. 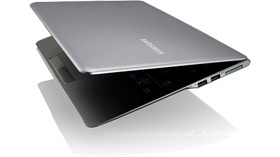 We would like to thank Tiger Direct for providing us with the Samsung Series 5 Ultrabook. If you like this review mention TechwareLabs and get yours here. Take a look at Tiger Directs full line of Ultrabooks.